Thayne-san, today we’ll be going to a soba noodle shop in Ueno, quite near your English school. 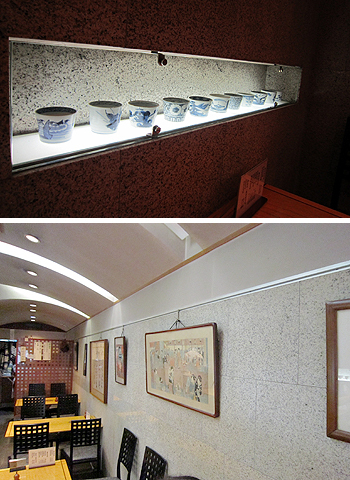 The shop is called Rengyokuan, and it was founded in 1859. Do you know about it? Like maybe they would get angry at you for eating soba the wrong way? Exactly. I wouldn’t want to ruin the atmosphere! Hi Thayne-san and Concierge-san, I’m Sawashima of Rengyokuan. Thank you. This building was built in 1954, but in 1989 we reopened the shop after a major renovation. 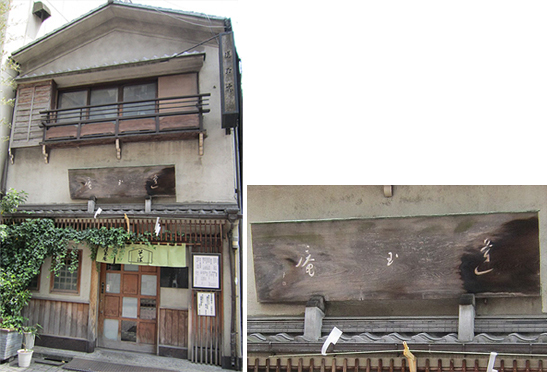 I hear the shop was founded in the Edo Period. And after that, it was passed down generation to generation in the Sawashima family. What generation master are you? Being born into a family that runs a soba shop, were you required to study how to make soba when you reached a certain age? Actually, not at all. There was a worker to make the soba, and someone else cooked it. Everyone was a professional. So the master didn’t interfere unnecessarily. Only the soba tsuyu (dipping sauce) was made by the master. So every morning the master would come to the shop to make the sauce, but after that he could leave everything to the other workers and visit his favorite hangouts. Oh, really?! Does that mean your father took it easy? So then when did you learn the art of making soba tsuyu? All I really had to do was observe my father quietly from behind. In his later years when he fell ill, I took over in the kitchen the very next day. 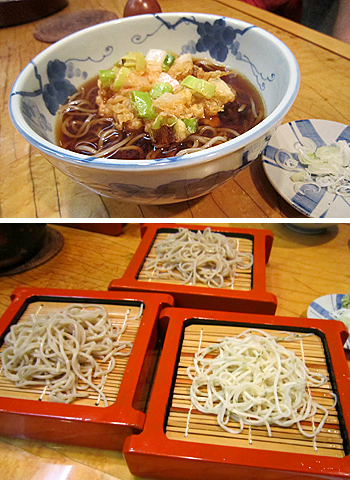 Once you had made the soba sauce each day, did you go out on the town like your father had? Thayne-san, Sawashima-san is well-known as a man with exquisite tastes, even amongst the Toto Norenkai members. I think you would say many of his interests go beyond being mere hobbies. Take jazz for example: I hear his collection includes 270 Duke Ellington records. Yes, I loved the man as well as his music. Whenever Duke Ellington toured Japan I always went to his concerts. I also did things like writing books about him. I also loved rakugo, and when I entered Chuo University they didn’t have a rakugo club at the time, so I started one myself. It’s still around, and I hear some professional rakugo performers got their start there. Taking your hobbies seriously may not actually run through your blood, but I can see it’s been a tradition at your shop since the first generation. Well, Thayne-san, are you about ready for some soba? 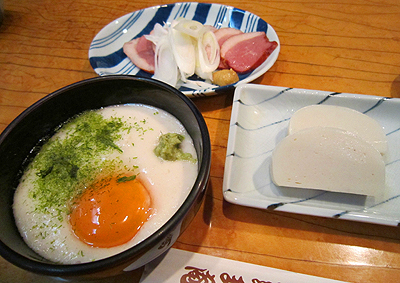 Our side-dishes are “ita-wasa” (fishcakes with wasabi) and tsukimi-imo (“moon-viewing potatoes”). What style of soba would you like? Thank you. Actually, these days my daughter makes the soba. Really? That’s great! Your daughter makes the soba, you make the soba tsuyu, and your wife serves the customers. That’s got to be a great team! There’s one last thing I’d like to ask: as a soba shop, what do you consider to be important above all else? That’s a great philosophy. Thanks so much for your time today. 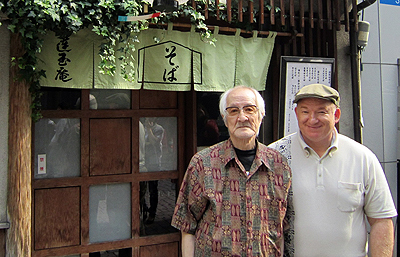 We’ll be back sometime for more soba!